Heat oven to 350°F. Let cookie dough and mascarpone cheese stand at room temperature for 10 minutes to soften. In medium bowl, break up cookie dough. 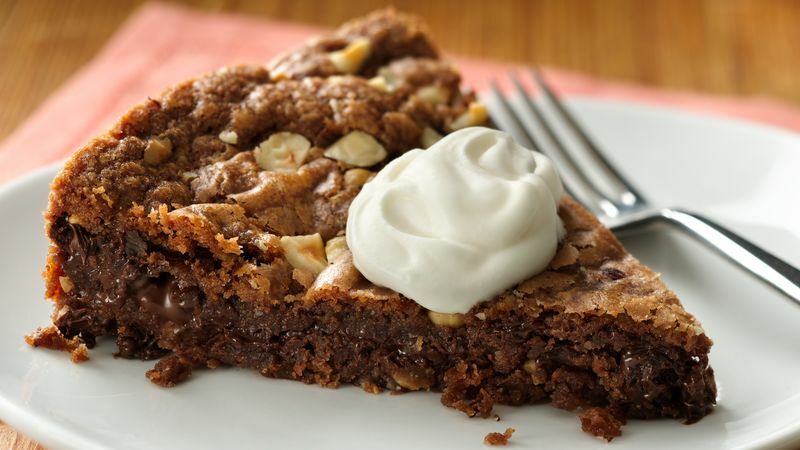 Add 2 tablespoons of the mascarpone cheese, 1/3 cup of the chocolate hazelnut spread and 1/2 cup of the hazelnuts. Mix with wooden spoon until well blended. Press 1/2 of the dough mixture in bottom of ungreased 9-inch springform pan. In small microwavable bowl, microwave remaining 1/3 cup chocolate hazelnut spread on High 10 seconds; stir until spreading consistency. Spread over dough to within 1/4-inch of edge; sprinkle chocolate chips over chocolate hazelnut spread. Place remaining dough between layers of waxed paper. Press into 9-inch round. Peel off one layer of paper. Place dough side down over chocolate chips. Remove waxed paper; press edges to seal. Gently tap pan on counter to settle. Sprinkle with remaining 1/4 cup nuts; lightly press into dough. Wrap outside bottom and side of springform pan with foil to prevent leaking. Bake 30 to 40 minutes or until puffed and edges are set (center will jiggle slightly). Cool on cooling rack 30 to 40 minutes or until center is set but still warm. Remove side of pan. Meanwhile, in medium bowl, beat whipping cream and sugar with electric mixer on medium speed until soft peaks form. Beat in remaining mascarpone cheese with electric mixer on low speed until combined. Refrigerate. Serve wedges of warm torte with mascarpone cream. Hazelnuts can be purchased toasted. If not available at your grocery store, toast hazelnuts by spreading in an ungreased shallow pan. Bake at 350°F 6 to 10 minutes, stiriing occasionally, until light brown.